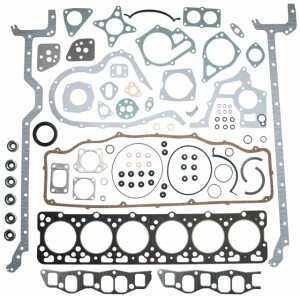 Which will contain all the gaskets and seals necessary to completely overhaul the engine both at top and bottom end. 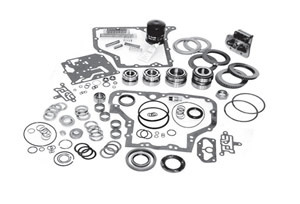 Which will normally contain Cylinder Head Gasket together with the Rocker Cover Gasket, Manifold gaskets, Valve stem seals and other ancilliary gaskets used at the top end of the engine notably water pump mounting gasket and thermostat gaskets. Which will normally contain the Sump Pan Gasket and other anciliary gaskets associated with the bottom engine rebuild, traditionally this will include the Front and Rear Crankshaft seals. 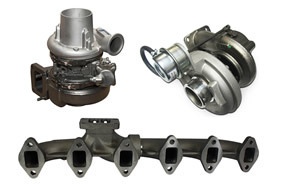 Depending on engine specification, Engine Fix UK will also supply individual gaskets such as Cylinder Head Gasket, Rocker Cover Gasket, Manifold Gaskets, Sump Gasket, Crank Seals and Valve stem seals. Cylinder Head Gaskets form the most critical seal on an engine, the head gasket must seal combustion pressures up to 2700 psi in turbocharged diesel engines. In addition, the Cylinder Head Gasket must withstand combustion temperatures that are in excess of 2000 deg F (1100 deg C). 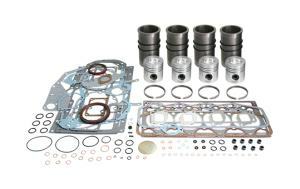 The head gasket must also seal coolant and hot thin oil flowing under pressure between the cylinder head and block. Modern coolant formulas, oil detergents and additives tend to cling to water/oil ways surfaces and soak into gaskets, so gasket materials must be chosen carefully to resist these fluids and maintain an effective seal. Many head gasket coolant holes also meter the coolant flow to ensure proper circulation and cooling. One factor is engine vibration and the head shifting and flexing as a result of the combustion pressures. Another factor is that Head gaskets must resist crushing from cylinder bolt clamping forces of 200,000 lbs (90,800 kg) that may be unevenly distributed across the head. Cylinder head gasket designs have changed over time, and in recent years with the need to meet new Emissions requirements they are changing ever faster. New engine designs and updates of older engines require advanced materials and constructions. There are two things you should remember, first of all you need to ensure that the gasket is manufactured by a high quality producer, one you can trust to assure that the engine will be sealed satisfactorily for a long time. However there is no one best gasket design since no single type is best for all applications. Exhaustive testing is performed to ensure the correct construction and design is used. 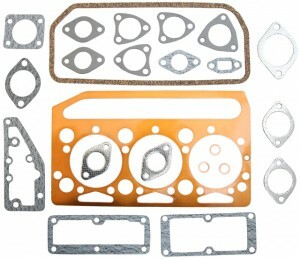 No-retorque head gaskets are now common, however many gaskets for import vehicles as well as older designs require the cylinder head to be retorqued. Retorque-type gaskets set after initial engine operation and relax to the point where retorquing is needed to restore proper clamping force. 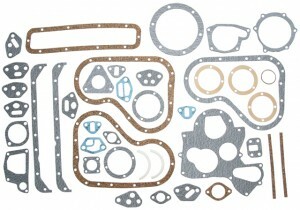 These gaskets use a variety of materials and basically consists of facings, coatings and a core. Cores can be either solid or clinched steel. Even if the core is a clinched steel type, the facing attached to it is dense enough to maintain torque and strong enough to resist blowout. Two facing materials used are expanded graphite and reinforced rubber fibre, these materials are dense enough not to relax too much, so retorquing is not required, buy they will compress enough to conform to minor surface irregularities of the cylinder head and block mating surfaces. Coatings are added as needed to further help sealing. They are typically Teflon or Silicon and selection is based on the operating temperature of the engine. These anti-friction coatings also act as anti-sticking agents so the gaskets will come off cleanly protecting the engine surfaces when servicing is required. Printoseal Elastomeric Sealing Beads also are used to augment clamping loads on critical sealing openings such as coolant and oil ports. Wire Ring Combustion Seals may be encased in stainless steel armors for increased strength in heavy duty applications, the rings can be manufactured out of copper of pre-flattened steel. A recent new development for Cylinder head gasket Technology is the Multi-Layer Steel (MLS) Gasket. At first glance these gaskets look like old-fashioned steel shim gaskets but these are very high-tech, a thin rubber coating is bonded to the steel shim and when required, multiple layers of this rubber coated steel shim are used. The rubber coating provides fluid sealability across the outer faces and between layers and helps seal minor surface imperfections, MLS gaskets provide excellent torque retention. Allow the engine to cool down completely before dis-assembly, cylinder heads tend to warp if removed whilst they are still hot and cylinder head bolts are more difficult to remove and are prone to breakage. Loosen and remove bolts in reverse torque sequence as stipulated by the OEM manual, in reverse order to loosen each bolt, then repeat the process to remove the bolts. Clean mating surfaces of all foreign material to ensure sealing surfaces are clean you may wish to use a degreaser. On the iron components use a scraper, wire brush or wire wool. Ensure you cover oil and coolant ports. Inspect the old cylinder head gasket for wear and damage, it will provide clues to previous or potential engine problems, for example as cracked amor may indicate abnormal combustion-denotation or pre-ignition. Replacing the gasket without correcting the problem can cause repeat gasket failure. Check for warpage and distortion, place a straightedge on the head surface and cylinder block and slide a feeler gauge between the head and the straightedge, a good rule of thumb for flatness across the length of the engine is as follows: 3 cylinder engines 0.003” maximum out of flat 4 cylinder engines 0.004” maximum out of flat 6 cylinder engines 0.006” maximum out of flat Across the width of the engine should be no more than 0.002” The flatness limits shown are the aggregate totals allowable for both head and block. If your head and block exceed these figures the head and block should be resurfaced by removing the minimum amount of metal to achieve the required flatness. Excessive resurfacing can result in possible valve/piston interference issues. Inspect all engine parts, look for irregularities that may cause leaks such as gouges, scratches or cracks, replace cracked or badly warped parts. Check new head gasket against old gasket and head and block to that that all oil and water ways and combustion chambers match, the combustion openings should be slightly larger than the engine bore and may have irregular shape to fit valve pockets in the cylinder head. The gasket coolant holes may be smaller or shaped differently from the coolant passages in the head or block. This is because head gaskets are designed to control or meter coolant flow. The gasket bore, depending on the vehicle, can often accommodate up to a 0.060” overbore, the gasket should accommodate a reasonable chamfer of uniform size, however the combination of cylinder overbore and chamfer cannot exceed the cylinder head gasket opening size. Excessive overbore and/or chamfer will result in unloading of the combustion seal and lead to cylinder head gasket failure. Check the finish with a surface comparator, if the casting surface is too smooth, the gasket cannot grip the surface for a durable combustion seal, the surface is too rough the gasket will not conform to the surface, causing combustion or fluid leaks. A micro-inch surface finish of 60 to 100RA is preferred for cast iron and 50 to 60 RA for aluminium, however please note that some new generation Multi-Layer Steel (MLS) gasket designs require a very smooth surface finish to 30RA max. 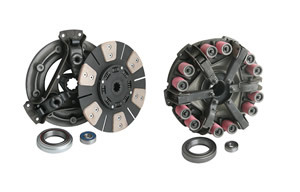 Clean and prepare bolt holes and inspect bolt holes carefully, especially if the head and block has been resurfaced. If the threads run up the surface chamfer and tap the hole so the threads will not be drawn above the surface when the cylinder head bolts are retightened. Use a thread chaser to clean the threads to the bottom of the hole, remove all loose material form the bottom of blind holes or the bolt may bottom out and reduce clamping force on the gasket. Clean and prepare threads on bolts, be sure to wire brush all the threads on all cylinder head bolts, check threads for damage. Dry or dirty threads in poor condition can decrease the clamping force by as much as 50%. To avoid this, it is best practice to use spray white lithium grease on the underside of all bolt heads/washers and on the threads of all bolts that go in blind holes. Use liquid Teflon on the threads of the bolts whose holes extend into the water jackets. Head bolts that penetrate into coolant passages need to be coated with a non-hardening sealer, this will stop seepage around the bolt heads. Seeping coolant could get into the oil or cause corrosion. 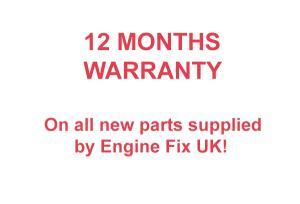 Follow the proper torque sequence and torque specification which is available in the OEM service manual, if you need assistance Engine Fix UK are happy to give advice. Carefully follow all instructions in the proper torque sequence, torque the head bolts to the specified torque, if the engine has torque-to-yield bolts, turn the head bolts the additional amount required using a torque to angle indicator.